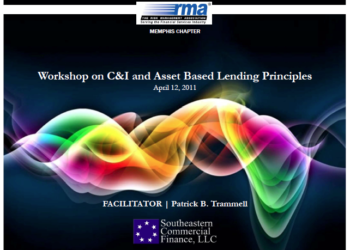 Pat Trammell is often asked to present at industry meetings and roundtables. On this occasion, it was for the Memphis Chapter of the Risk Management Association. The audience was made up of bankers, industry leaders, and Asset Based Lenders. What might seem common industry knowledge, it’s amazing how many people in the C&I industry skip the principles that build the foundation of our industry. Pat’s presentation gives keen insight on how to evaluate and structure a loan with confidence. Click here to read Pat’s Bio.